For many years now, people have been predicting email's demise. While it's true we use other forms of communication like texting and social media to "talk" to our friends or send quick messages to our colleagues, we still use email, especially for work-related communication. It is also the primary means of contact when you are applying for a job. It is as important as ever to know how to write a professional email. Email may be your initial point of contact with someone and because of that, it's your first opportunity to make an impression. Take great care in composing your messages. Before you hit send, answer these 7 questions. 1. Is my message error free? Checking your email for mistakes is the most important thing you can do before you send it. Incorrect spelling and bad grammar will make you look careless. That goes against the impression you are trying to make, especially if you are applying for a job. Proofread until you are confident you have caught all spelling and grammatical errors, as well as typos. Grammarly.com has free tools, including an extension for the Chrome browser, that can help you with this. 2. What does my email address say about me? 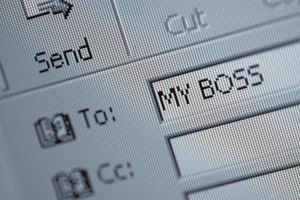 Your work email address—which by the way, you should never use for job searching—probably is very straightforward. Most likely it is some variant of your name. You may have chosen a less business-like address to use for personal email. An address that is suggestive, childish, or cute is okay if you are only using it to send messages to your friends and family but if you need to write a professional email, sign up for a new account that conveys professionalism. Set up an email address that uses your actual name. Try your first and last names; your first name, middle initial and last name; or some combination of those. Never send your professional email from chickybabe@mymail.com. 3. Are the name and email address in the "To" field correct? When you begin typing a recipient's name into the "To" field, most email clients will fill in the rest of the name with one from your contacts. You could easily end up with the wrong name in that field so make sure to pay attention to this. Imagine what trouble might arise if you accidentally send an email to the wrong recipient. Let's say you are looking for a job while you are still employed. A hiring manager at a prospective employer could have a name that begins with the same letter as your current boss's name. How embarrassing would it be if you sent your boss a message meant for that hiring manager? Not only do you want to make sure your message reaches its intended destination, but you also want to be certain it doesn't reach an unintended one. 4. Have I used the proper title to address the recipient? If you are already on a first name basis with the person you are emailing, it is okay to address them that way in your message. However, if this is your first time communicating with someone, or you aren't sure how they prefer to be addressed, it is preferable to use a formal title like Mr., Ms., Mrs., or Dr. and the recipient's last name. Always err on the side of caution. It can't hurt to be formal. For a hint about how someone with whom you already have an established relationship prefers to be addressed, look back on prior messages to see how they are signed. That will help you decide what to do. 5. Does my tone convey my message well? As the saying goes, "It's not what you say but how you say it." When you speak to someone face-to-face, you can rely on intonation, body language, and facial expression to help give additional meaning to your words. When you try to convey the same message in writing, there is more room for misunderstanding because the reader can't see your face, read your body language, or hear your voice. Make sure your message is polite and sounds friendly, and that your intended meaning is clear. 6. Is my message simple, but not cryptic? Keeping your messages short and sweet will make them easier to understand. At the same time, you should not omit anything important. You don't want to force the recipient of your email to guess what you are trying to say. Your message should be as precise as possible but include all the necessary information. 7. Have I included unsolicited attachments? Many people refuse to open email attachments they aren't expecting. They are right to avoid doing that. Computer viruses are often transmitted in those attachments. If you want to send a file to someone, for example, your resume, ask your recipient for his permission first. Send it only if he says it is okay.